We’ve been working non stop over the past few weeks on this room, starting from the biggest & most boring jobs—like a new ceiling and insulation, lighting, wiring, painting, and flooring. That’s all finally out of the way, and I’m thrilled to say that the room is starting to feel like the perfect loungy sunroom I’ve always wanted. It’s just like I had imagined. The plan is to paint it a deep turquoise blue. I found the perfect color in a spray can at Lowe’s (Valspar brand in Exotic Sea), but they were out of stock so I’ll have to run back for it tomorrow. No, they weren’t on sale (sigh), but for $20 for the pair… I couldn’t say no (dang you, Target). On another note—this chair situation has been my biggest stress factor in this entire room project. I’ve been lobbying to replace it with a fun patterned slipper chair (or something just a bit more modern), but Brad *really* loves how comfortable it is and wants to keep it. here, but I’m going to attempt to slipcover it. Without a sewing machine or any knowledge of sewing… I’ll be using stitch witchery instead. Desperate times call for desperate measures. If you have any advice, please, I need all the help I can get. Yes, it is as relaxing as it looks. The weather has been heavenly, and we’ve been keeping the windows open and just camping out in this room for the past few days, enjoying the warm sunshine and the breeze. Brad didn’t agree with my “beds as a couch” vision at first, but now I have to pull him out of there to come to bed. 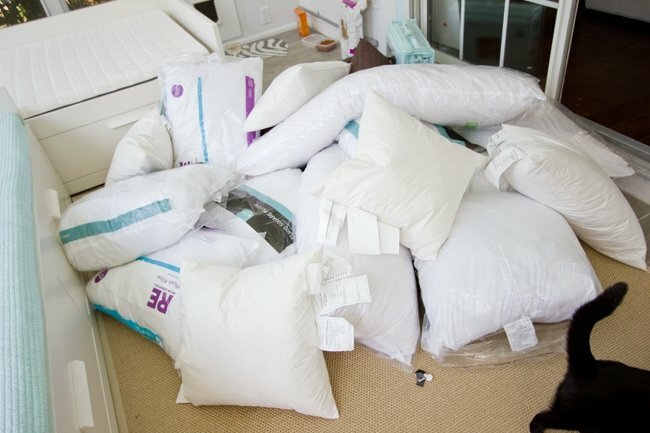 The pillows are all mostly bare right now, but that will be fixed soon. I found an amazing shop on Etsy and I’m excited to share with you all the fun pillow patterns I’ve picked out. Yep.. it’s a coffee table. I built it a few hours ago. It was honestly one of the easiest things I’ve ever built. Didn’t even need Brad’s help. I’ll post a tutorial soon. And with that… I’m off to crawl back in there and enjoy another warm Florida spring evening. 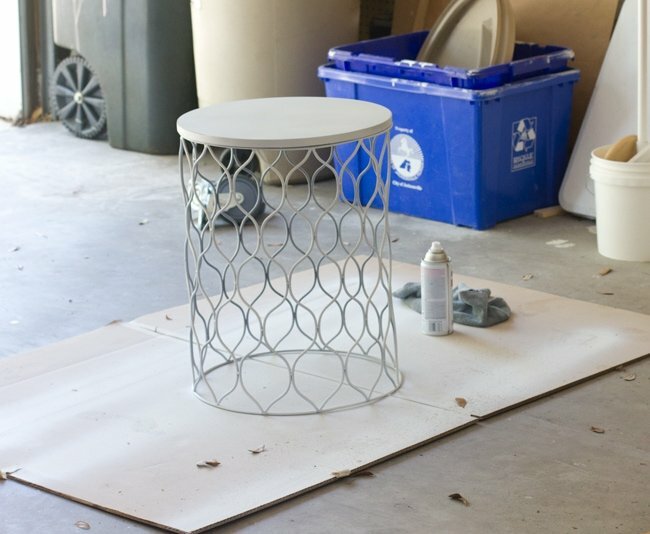 I hope the weather is treating everyone else as nicely… stay tuned for a coffee table tutorial! That looks so great! I love the clean and fresh look. Gorgeous! I want to come hang out in your sunroom! I'll bring the cocktails. 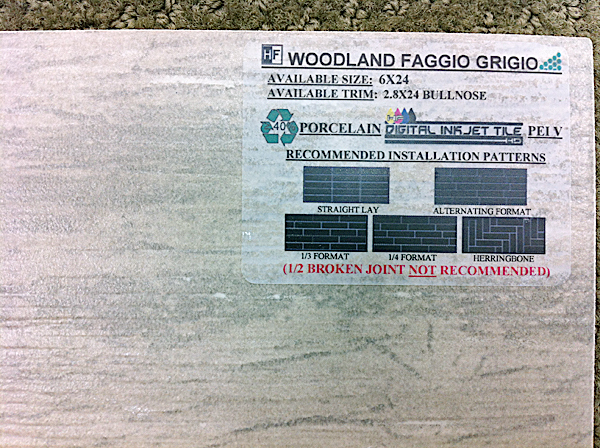 I also am a huge fan of faux wood plank tiles. I hope to have a house one day where I can install them/have them installed. The whole room looks beautiful. Stunning! It looks so relaxing!!! Looks amazing. Can't wait to see the final reveal! I'm impressed with the coffee table as well. Looks fairly simple to make yet stunning at the same time. Looking forward to the coffee table tutorial. I live in Florida too! Can I come visit and sleep in this room?! Hahaha! Can't wait to see how it all turns out. This room is turning out beautifully – can't wait to see your finishing touches. And also, I kind of like the beige chair and ottoman as is. I'm sure if you gussy it up with some accent pillows and maybe paint the legs a darker color it won't look as bland. It's all looking mighty comfy! You are doing wonderful!!!!!!! It looks sooo good. Love reading your blog. I just recently started following you. Great job and the table is a great addition to the room. I know you've spent a lot of time bringing this room to a new life. Awesome space. Looks good so far. I love the calm color palette. Okay, just got caught up from beginning to end with your blog, love it! I would like to hear a little more about your business. For the chair I recommend going to the Goodwill and getting some white colored sheets or whatever color you want to use to color them. You will need some flat ones for sure but could use some fitted for the cushion. I have never done this but came pretty close with an old sofa. You can dye them with fabric dye after washing and drying on sanitizing setting or hottest you can set both washer and dryer on, of course. Guess at the outside length and then fold to the inside and wrap the chair. If you lucked out and got like a king size sheet it would make it easier. The trick is to put PVC pipe or wooden dowels or something at the inside bottom around the cushion to keep the fabric from moving. If you use more than one sheet to wrap the outside just make sure the seams are not jumping out at you. 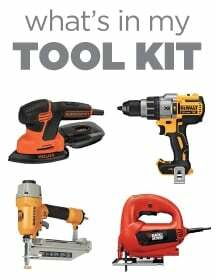 Try the cheap DIY first. Slipcovers cost a fortune. Tablecloths might work good, too! Wow… this is coming along so well! Love the color pallet you chose for this room…and the daybeds… perfection! 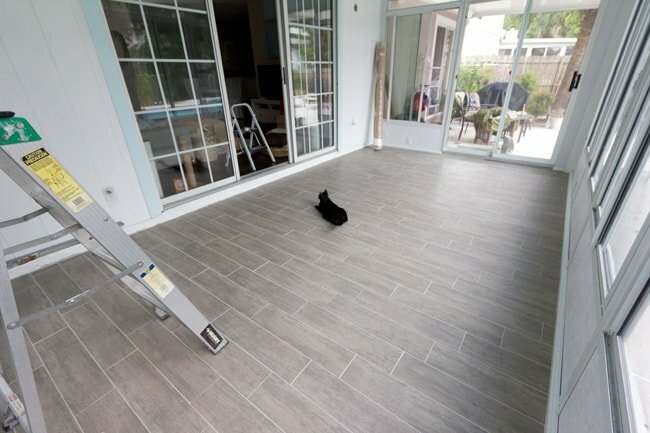 My fiance and I love the flooring in the sunroom. 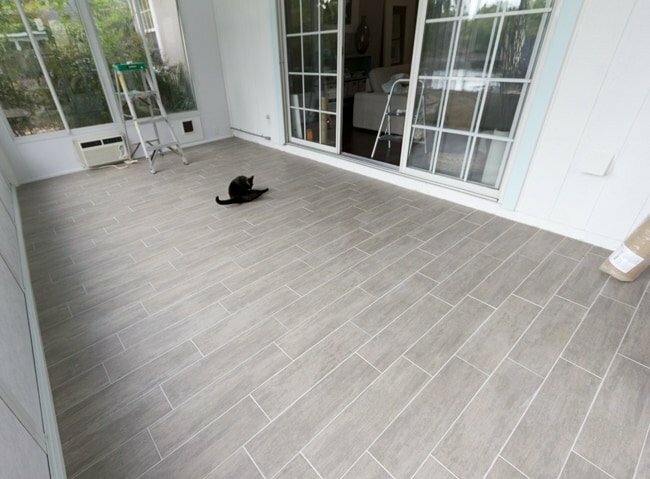 Thank you for sharing the type of tile… Did you have to special order it? I also love the floor in your bedroom. Was that your addition or did it come with the house? 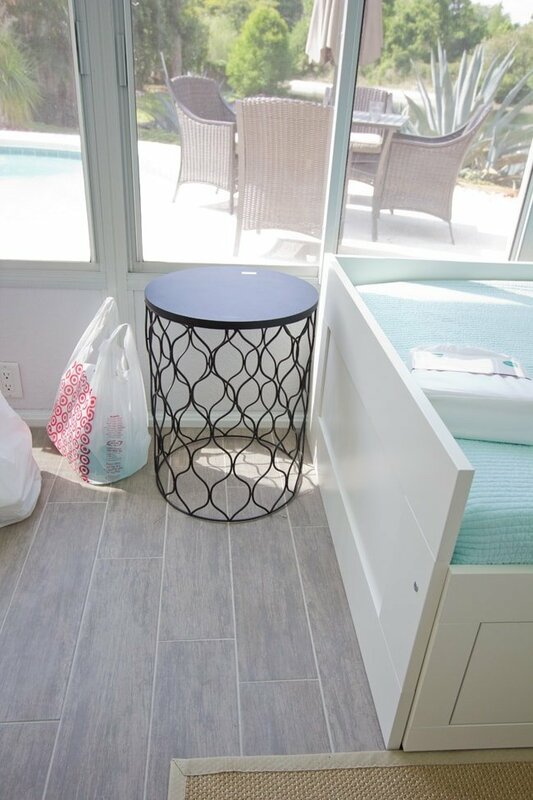 So so gorgeous – love the flooring – and of course, all the rest – lots of great ideas! Wow! Absolutely stunning! 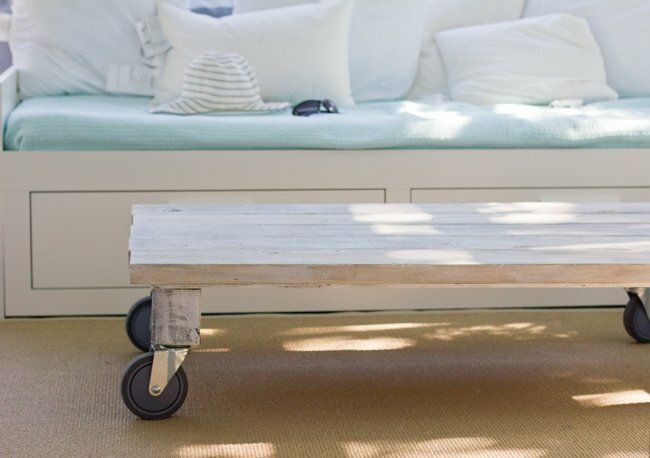 For your additional sunroom-to-do list, Jenna, why don’t you add plants? 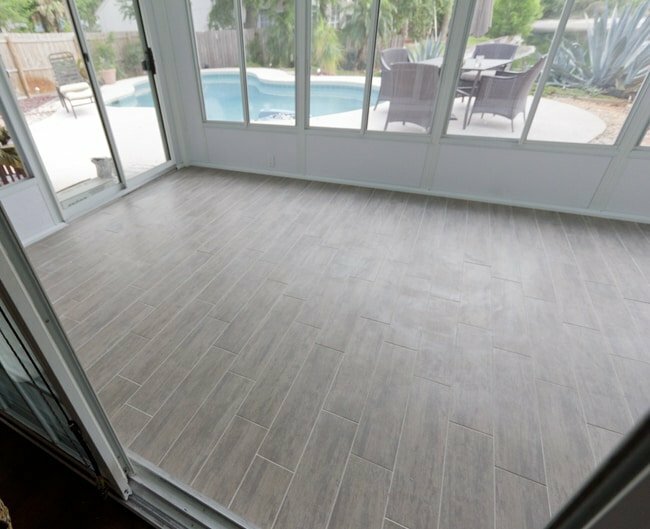 It will give your sunroom a nature concept. 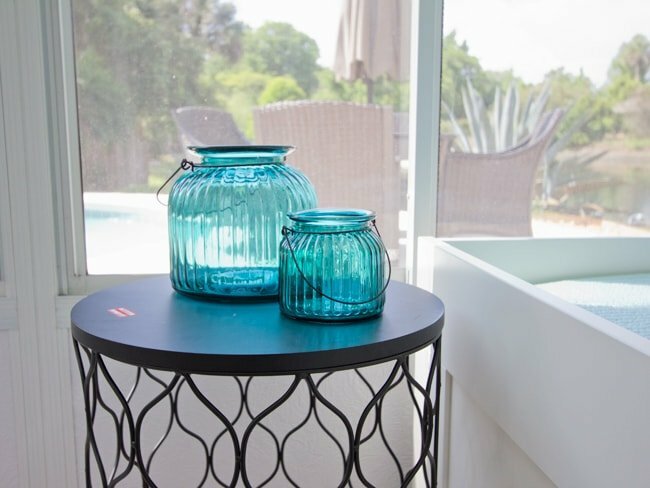 You can select colorful plant vases/containers that would go well with your sunroom theme. I absolutely cannot get over how much I absolutely LOVE the floor tiles! 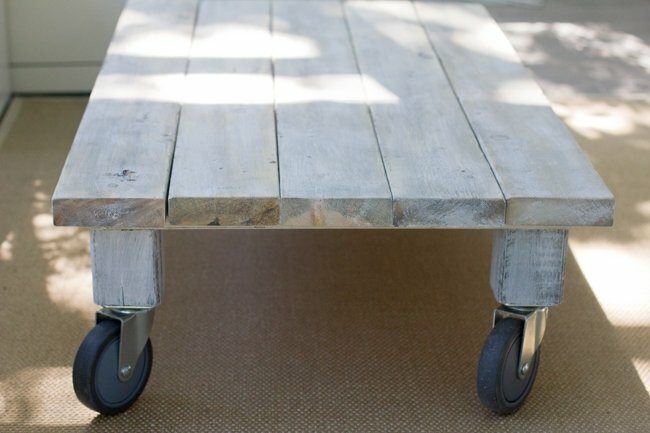 Have you posted the coffee table tutorial yet? I want one! 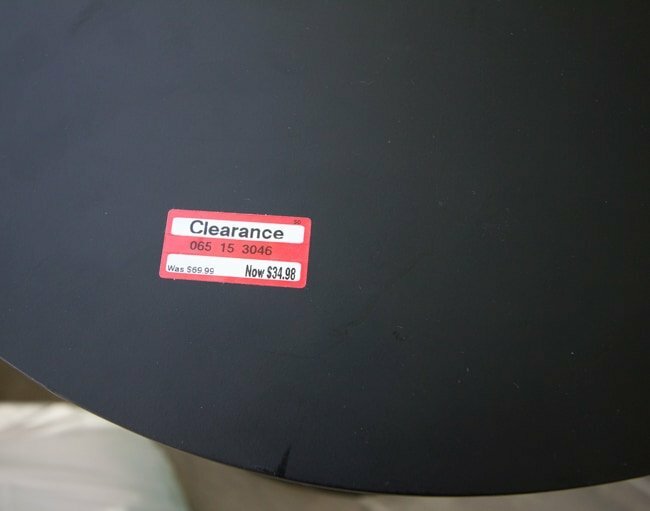 How are the table tops holding up with the paint? Did you do any special prep? We use ours ALL the time as our end tables in the family room and I'm a little nervous about it. Beautiful sunroom! Where can I get these tiles? I looked online but can only find a place that sells it for $100 per square foot!! That can't be right. We got ours at a local dealer called the Floor Club, not sure where you can get them elsewhere! Good luck! 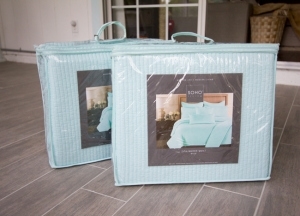 I have been looking for a quilt/coverlet for a daybed in that exact color! Do you happen to now the brand/color so I can search for it? Thank you! Thanks Cassie! 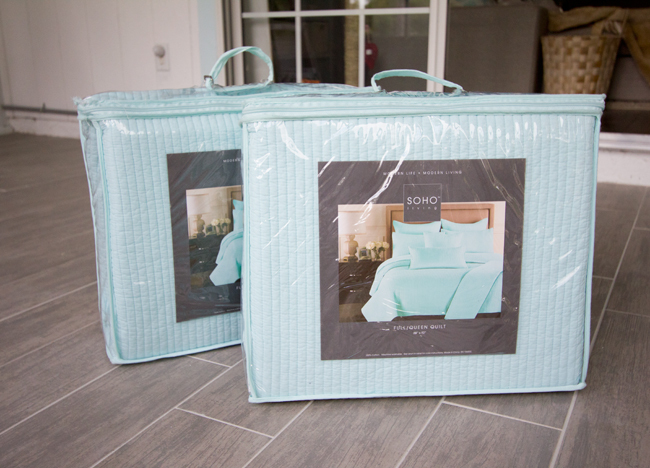 The photo of the package looks like it says SOHO living, but I'm not sure about any of the other details. Hope you can find it somewhere! The L shape is divided by a board of wood, anybody broke his back already by jumping on it .. would it be possible to cut it away or would that make the BRIMNES unstable? The side of the bed is quite visible so there wasn't any issues. We considered cutting it but that would have left a visible jagged edge and the bed would be unusable in any other configuration. Now that we're in a new house and will likely separate the beds I'm very glad we left it intact! Absolutely love your work! 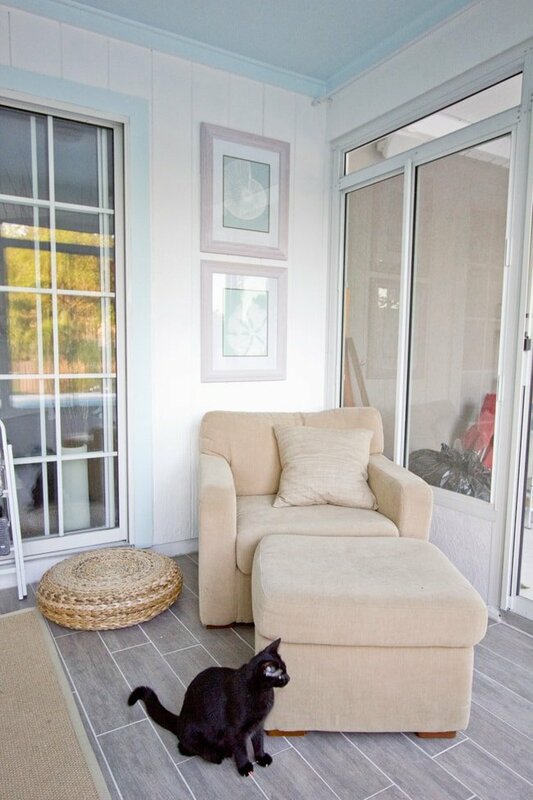 The colours in your sunroom are inspiring. Do you recall the colour on the wall (soft white-ish)? 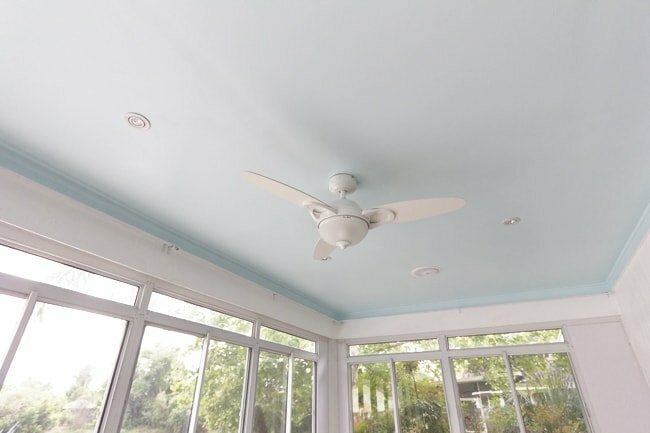 It looks great with “tropical mist” on the ceiling. PS your new house is coming along nicely! …enjoying the posts. Thanks Michelle! The sunroom walls were already painted when we bought the house so I'm not sure of the white—sorry! Love Love Love your style and designs! Just recently moved to Florida and purchased a home and have begun my own projects and looking at yours as inspiration and jealousy. One that's still left to do is painting. I love the color on that you have on the master bedroom wall (the pic of the borrowed art from your bedroom), a very light sea foam color. Any idea what the color/brand of paint that was? Is it the same color as the studio room from your previous posts? 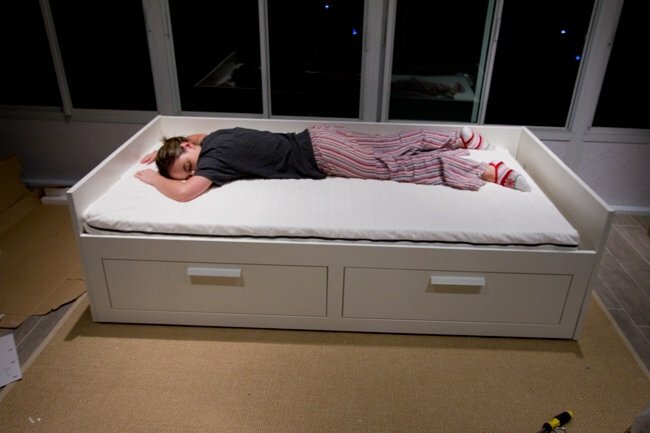 Now that you’ve had the Brimnes daybeds for a while (and survived a move?! ), how are they holding up? 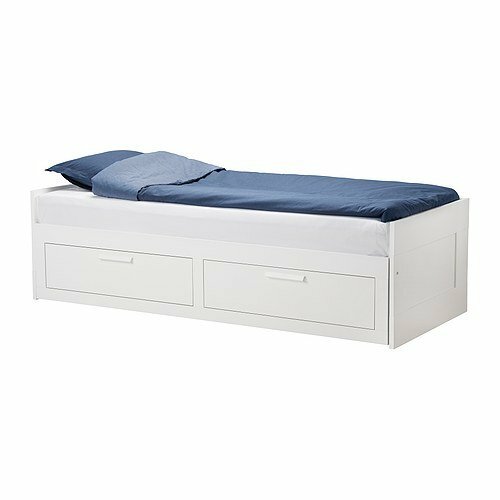 I’ve read that they’re flimsier compared to the other Ikea option (Hemnes), but contrary to most people, I like the look of this one better. Unfortunately we had to disassemble them for the move but we didn’t have instructions for rebuilding and couldn’t figure out how to put one of them back together properly (not sure how that happened!) So one is still going strong and the other one isn’t perfect. But I would agree they are flimsier than the Hemnes line which uses real wood I believe (our Hemnes dresser is holding up better than the daybeds for sure).